If you fancy a 'ladies who lunch' session in Cheshire then try the pretty and floral upstairs cafe at Gastronomy in Hale village. I went recently with my mum and had this beautiful middle eastern salad and a strawberry milkshake. Gastronomy offers a selection of lunches with an extensive cold and hot sandwich menu as well as a selection of salads. They also offer glasses of wine and a variety of deli style soft drinks like fruity San Pellegrino. This middle eastern salad was made up of falafel, olives, hummus, grated carrot, peppers, tomatoes and lettuce and was really tasty and filling. My mum had a salmon caesar salad which was really generous on the fish. Lunch for two with a glass of wine and a milkshake cost £21. The pretty floral decor and the breeze flowing through the open windows made this a great mid week lunch location and I even went back again with a group of friends the following week. Hard Days Night Hotel, Central Buildings, North John Street, Liverpool L2 6RR. 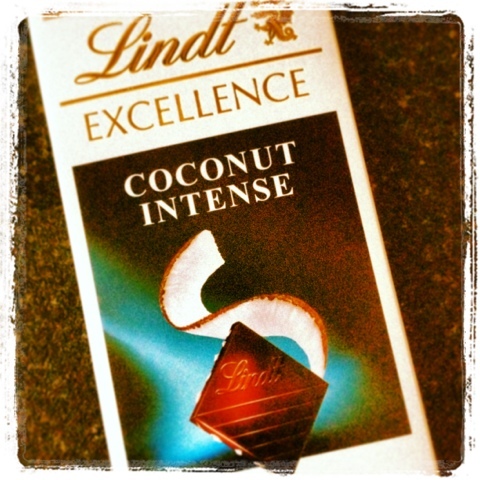 Try this Lindt coconut chocolate out of the fridge - heaven! All photos and text by CookiesCooking cannot be used unless given permission. Theme images by linearcurves. Powered by Blogger.